Old Fashioned Painting Techniques....quick guide. The Steampunk Forum at Brass Goggles > General Steampunk > Tactile > How To... (Moderator: von Corax) > Old Fashioned Painting Techniques....quick guide. As a relative newcomer, I've noticed that much of the artistic output of steampunk is concerned with the 'plastic', i.e. making or adapting objects in order to 'steampunk your lives'. This is not a criticism, I find it very charming, but to a great extent you are still relying on the knowledge and skills of a former age (those who made the parts that you are now recycling). 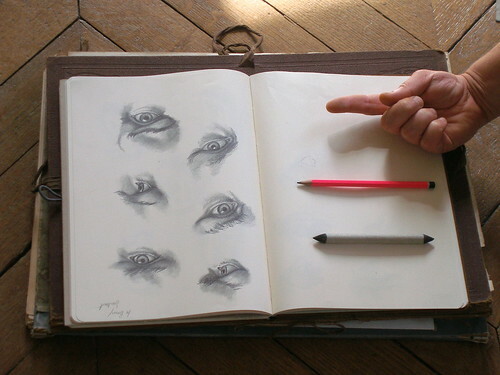 As far as the 'drawing and painting' output is concerned, I find many of the ideas very exciting but I can't help wondering whether you might be interested in a little bit of knowledge regarding traditional drawing and painting techniques? Painting using traditional techniques is something I've been practicing for 24 years now (13 years full time), so if enough people are interested, I'm willing to start posting tutorials and the relevant info that you'd need to start realizing your dreams in paint on canvas. 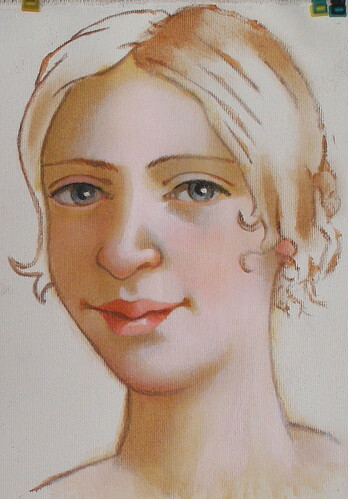 Don't be put off by the thought that you'll never be able to paint as well as an 18th or 19th century painter; the techniques can be taught quite quickly, it's only the practice to perfection that takes a long time - particularly drawing practice. 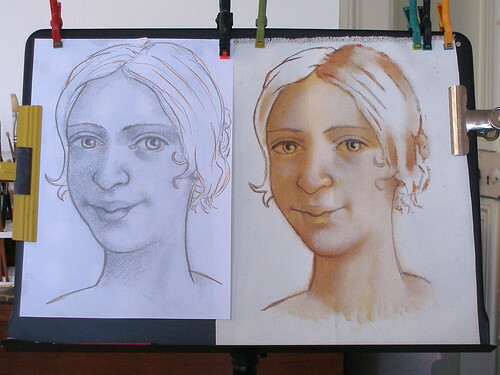 Don't be put off either by the thought that you might just end up as a 19th century 'clone' painter, you can adapt good technique to almost any personal (representational) style you like. Re: Old Fashioned Painting Techniques....Appeal to steampunk artists. Sign me up! I've been painting and drawin as long as I remenber, and I often find myself thinking;"There must ben an easier way...". Spread your pearls of wisdom good sir. Post haste!!! Gladly Mr. Stonebender. If anyone else joins in, let me know. I'm not setting myself up as a know-all painting prof, I consider myself a servant and student of painting, nothing more. If anyone knows better, I'm always happy to learn. Judge for yourself. Thomas Couture, “Entretiens d’Atelier”, 1860. (English and French versions). Couture won the prix de Rome in 1837 and was a student of Antoine Gros and (briefly) Paul Delaroche. - Much practical info, interspersed with contemporary rantings. Mrs Mary P. Merrifield, “Original Treatises in the Arts of Painting from the XII to the XVIII th centuries (in English), 1849. Staggering compendium of info. Charles Alphonse du Fresnoy, “De Arte Graphica” (”The Art of Painting”), 1648 (in Latin), 1708 (in French, translated by Roger de Piles), and 1714 (in English). Du Fresnoy was a student of Simon Vouet - who took Italian painting to France. De Piles (painter, critic and painting buyer to Louis XIV), by translating Du Fresnoys work, inspired the next two centuries of European painters. Good book to ease you into the painters ‘universe’. C. A. Jombert, “Methode pour Apprendre le Dessin” (Drawing Course), with illustrations by Raphael, Titian, Le Brun, Domenico, etc, etc,.1755 (French only). Excellent starting point for learning to draw - the basis of older painting techniques. And here are a couple of examples of the techniques in practice (provided I've sussed this picture link thing)..
What my poor photography doesn't show is the fantastic effects that can be achieved using such luminous, transparent techniques, when light is correctly focussed on the paintings - if you've ever been to an old master art fair, you'll know what I mean. If you think you'll never have the patience to wait two weeks or more between sittings while the paint is drying, you can use the same techniques with acrylic paint (with a retarder and thinning medium) but it is more difficult as you need both a lighter touch and confident strokes. I'm working on two small acrylic paintings using these techniques at the moment - should be finished next week some time. What's the point? I don't know if you can tell from the photo's but old fashioned techniques can create effects that you just can't replicate with 'alla prima' modern painting methods - especially the skin tones. As an added bonus, they use comparatively very little paint, so you can afford to use the good stuff! Before I post up the basics, I need to do a few sketches and take a few photo's so bear with me. It has a button on it! I want to push it! As an artist myself, I am always looking for new and interesting styles. I find different techniques can lend themselves to practically any style. Which is a bonus as I'm rather addlepated most of the time. I move to the city to start art school this sunday and would be most highly interested in any and all instruction you would grace us with. I've spent the last four years learning photography and the art of moving picture, which is my intended course of study, but have had no time in my schedule for artistic instruction since middle school, so I have got quite a bit of catching up to do this semester. Ah, if only the late Bob Ross had been a steampunk. OK, here we go then. In 1910, C.J.Holmes adequately summarized the three ‘old master’ methods: The Flemish Method, The Venetian Method and the Mixed Method. 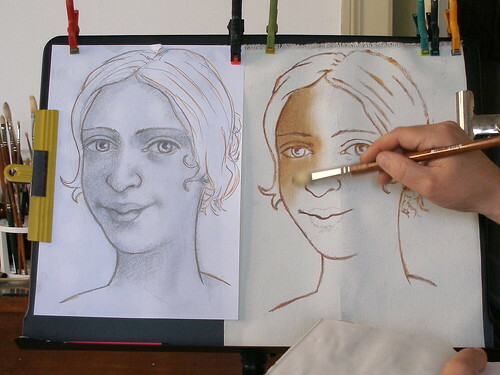 Each Method is in fact a painting PLAN, made up of several STAGES each completed using various TECHNIQUES. The order of these stages within the plan can be infinately varied, as can the number of techniques used which all adds up to the wonderful diversity of style evident in painting before the impressionists reduced the plan to but one stage and technique - Alla Prima! The Flemish Plan - involved painting in multiple layers of (usually unmixed) transparent glazes where the white of the support is left to show through the most in the highlights and is most obscured in the shadows (like constructing a painting with layers of thin, coloured glass - the Van Eycks, who were credited with it’s invention, were previously active in the creation of stained glass windows). The Venetian Plan - involved under-painting broad areas of opaque, flat colours (the ‘dead painting’) and applying transparent glazes over the top to create light and shade, before the final addition of details. The Mixed Plan - arguably the most common and most successful of the last 500 years - was basically the Flemish plan but with the addition of opaque colours to form the highlights (the shadows were left transparent). What I'm going to describe in the next few posts is the mixed method - in what I consider it's simplest form. After a while, you'll be able to vary the stages in the plan, take shortcuts, etc. 4. 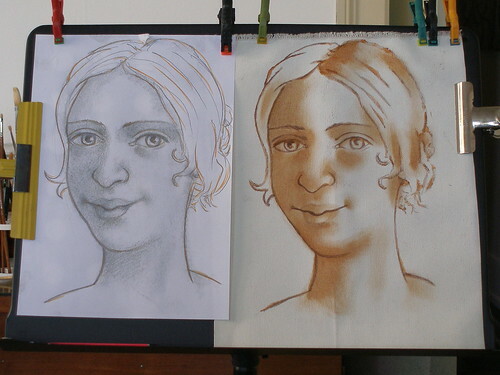 Do light and shade underpainting using your drawing as a guide (technically: chiaroscuro in verdigris or bistre using frottis technique). 6. Do highlights in opaque (non transparent) paint and scumble (light paint over dark) into mid tones. 8. Stand back and scream. 1. Daub outlines of idea onto canvas. 2. Paint it 'alla prima' (in one sitting) with (usually) opaque paint. 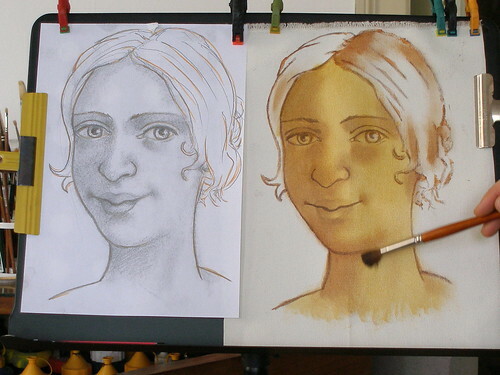 As you can see, the basis of your painting (the under-painting) is a 'carbon copy' of your drawing but using paint. Why not draw straight onto canvas? Because the paint is going to be transparent and you'd see all your smudged and rubbed out work AND because the drawing stage is where you let your imagination fly, experiment and make your mistakes AND for the last 2,500 years, the greatest painters of all time haven't found a better method! 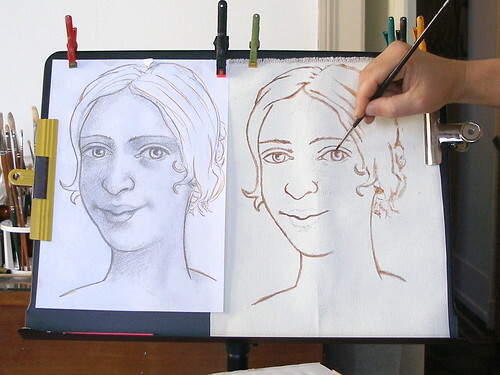 First a quick demonstration of what you are trying to achieve with your drawing, then, in the next post, I'll show you how to do the same thing with paint (give me a few days, I'm quite busy at the moment). What you are trying to do here is learn how to do your under-painting. 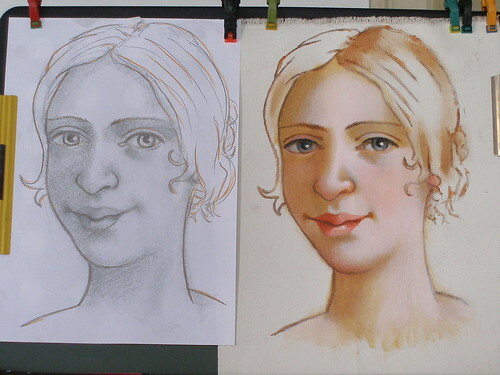 The quality of your painting using old techniques is directly related to the quality of your drawing. So learn to love drawing. If you're a beginner, expect to have to wait quite a while before you achieve results you're pleased with. A little every day is far better than the occasional drawing 'binge'. HOW TO LEARN? The more you know about the traditional canons of the human figure, the more you can play with them and create your own 'steampunked' figures. 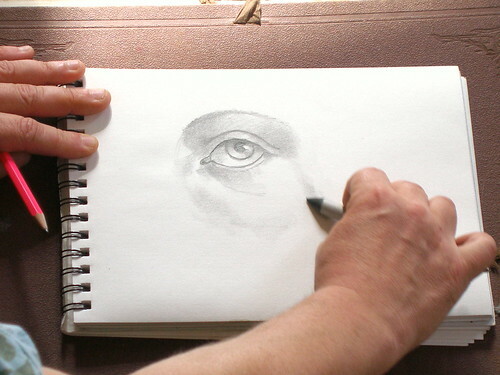 Traditionally, start with learning to draw an eye, then two, then the nose, then the mouth, then a whole face and head. Then tackle hands and feet, arms, legs, torso's and finally the whole body. After you've mastered the human (or mutant) figure, everything else is easy peasy. 'Guide to facial expressions' by Gary Faigin. "Cours de dessin" - Charles Bargue and Jean-leon Gerome (a modern reprint of a 19th century drawing course). My favourite (which you can now download for free on google booksearch) is the Jombert, 'Methode pour apprendre le dessin'. If you're a beginner, I'll see you again in about two years then! Wow! This is indeed a great lesson I can't wait to the next one. Bravo! Arrant Carney. Phmebian Cultural Attache. Anyone who is willing to share their expertise with others is a major gain for our group. You will find us all to be keen students and eager to learn. Be ready for lots of questions, we're an inquisitive lot. Such are the feeble bases on which many a public character rests. Today, I am two, separate Gorillas. Recently I have been mulling over wanting to improve my artistic skills. Lately I've focused on my 3-d work and crafting and let my 2-d skills fall to the wayside. It has been nearly 7 years since I took any sort of art course, though I took them throughout school. I have never had the occassion to take any more intensive classes. This has already given me a lot of information and inspiration to go forward with! I very much await the next installation. Lovely stuff - I did a lot of this sort of thing (The layering in oils especially - bane of my existance, oils. Oils and baked alaska. And suspenders.) in my art course a few years back, but I was by no means a natural and didn't have the patience to practice for long enough to get really good. Incidentally, I don't know if you could offer any advice on how to stop my home-made tempera seperating? I think it's because I'm using the yolks from our hens in the garden, which have exceptionally strong membranes (You can barely make an omelette from them because they won't mix) but I wondered if you had any experience to offer. What a great thread. I always love reading about this kind of thing, even though I primarily work in digital - the theory, and to some extent the technique can always be put to good use, no matter what the media. P.S, Andrew Loomis is an invaluable resource for anyone looking to improve their figure drawing. ""When I was ten, I read fairy tales in secret and would have been ashamed if I had been found doing so. Now that I am fifty, I read them openly. When I became a man I put away childish things, including the fear of childishness and the desire to be very grown up." -- C. S. Lewis, 1966"
And introducing the wonderful Irish (Mrs Z). I earned a bachelors degree in Fine Arts waaaaaaaaaay back in 1984. 4 years of hard work, and I don't remember EVER getting a class with such easy to understand instructions that actually make sense. Not only that, I'm pretty sure we never actually covered anything other than the HISTORY of the old masters. Never actually how to reproduce their methods. Perhaps if I'd gone on for the masters program....? YAY! I've learned something new today :-). I'm looking forward to the rest of your tutorials with extreme anticipation. Thank you for volunteering your time and expertise. "At least those oddballs are interesting" - My Wife. I'm British but living in America. This might explain my spelling. So that's what it's called! I've just been referring to it as my "Smudgy Pencil Thingy". Thank you so much taking the time to show us all this! I love painting and drawing, though I rarely find time for it now, and any new techniques and skills are greatly appreciated! I have a feeling this is going to have to be stickied.. I'm as mad as I am, but no madder! Live in Victoria? Check out the Victoria Meet Up Thread! Madam, I would sincerely like to thank you for sharing that link. My Loomis books went up in smoke several years ago and I have never been able to replace them. Also, I would like to second the "sticky" nomination for this thread. The pleasure is all mine, I can assure you. I'll put the next installment up hopefully in a week or so. 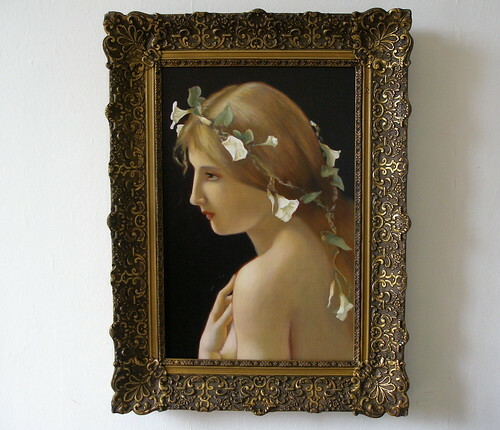 Ixiana - I'm afraid I'm a complete amateur when it comes to egg tempera but I do know a dutch artist who I believe is a bit of a tempera expert, so the next time I see her, I'll try to get an answer for you. Gentlemancaller - that's just what I thought. I love the digital work I've seen and I think it's ideally suited to being reproduced in oil (or acrylic) on canvas using old master techniques. What a potentially great addition to the body of world painting, don't you think? Thanks again, your comments have made my day! P.S. Excuse my ignorance but what does 'stickied' mean? Well, if a thread is deemed to be something that is important to the forum and frequently accessed, then it is 'stickied' at the top of the page, so no matter how many topics are posted, this thread will always remain at the top. You cannot mesmerize me...I'm British! My digital work improved no end when I started using these techniques in ernest a few years ago. Any digital artists out there should definitely be taking note as well. The Chiaroscuro, glazes, solid painting and scumbles. To all those who can already paint, I apologize for the 'assumption of no prior knowledge' stance of this post. It's just that when I was learning myself, I couldn't find many (old) sources of information that didn't already assume too much knowledge! A common mistake is to try to do too much too soon. 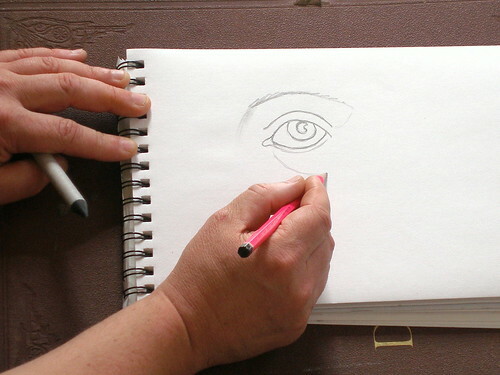 With your drawing, you can go from rough sketch to refined, finished product in one sitting. With your painting, however, you should be aiming toward refining you work; layer by layer by layer; only achieving 'perfection' at your last sitting. "Do as little work as you can possibly get away with but not so little as to let anyone think they can do it!" For demonstration purposes, I am going to do a quick painting sketch of a face using the absolute minimum number of layers - to avoid confusion - so I don't expect it to look very refined when finished (especially not in unforgiving acrylic). After each stage, I will describe any 'improvements' I would normally make but have avoided for the sake of simplicity. I'll describe the brushes you need at each stage. Anything specialist is not an absolute must - (round) hogs hair can blend very well (particularly with oil paint) as long as it's a clean, dry, fluffy and a large enough. For both acrylic and oil, you'll need a red, yellow, blue, black and white BUT not any old hue! 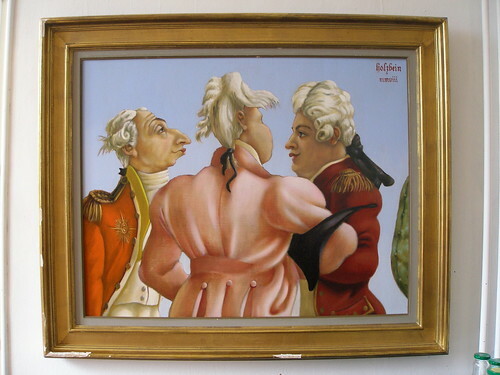 English red - it is not just a patriotic statement; it was the earthy red that has been prized by old masters forever! Transoxide red, or oxide red or similar - I've run out of English red in acrylic (which I'm using for this demonstration) so I'm using transoxide red instead. It's a little brutal - especially for a woman's complexion - but it's all I have. Burnt sienna - same applies as above. Vermillion - for extremities, cheeks, lips, etc. and for the solid highlights. 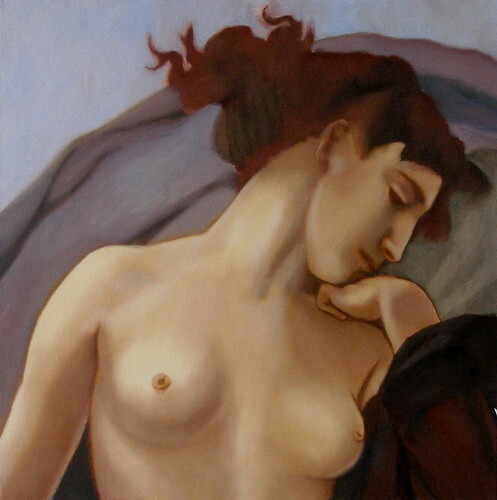 Permanent red (optional - I was commissioned to paint copies of some 19th century painters work - bouguereau, et al - and it took me ages to work out that they must have used a red similar to the modern 'permanent red' to make the pinks for their highlights. I quite like the effect, so I now use it quite a lot). Cobalt blue - save up and buy the genuine article - not cobalt blue 'hue' - it's beautiful! ANYTHING BUT LAMP BLACK! - which rarely dries thoroughly, flakes and is often lifted off by varnishing (I don't think you can get it in acrylic anyway). Ivory black - is not ideal if used alone (too inflexible) but mixed with yellow ochre ( = verdigris) or English red ( = bistre) for your under-painting, it'll do fine. Lead white - if you can get it or dare risk using it. Zinc white - OK, but not alone. Mixed white - as for zinc. A mix of any acrylic medium, (which says it,'s suitable for glazing) and a retarder. I prefer the gel type retarders, because they don't end up streaming down your hand, dripping onto your trousers, drying and looking like something else! Just put a drop or two of each on your palette mix them together and then mix a little with your paint. If you use retarder alone your paint will become brittle - mix it half and half with a medium and you won't have to worry too much about the ratio of paint to medium. Choosing a medium to use with oil seems to be one of those things which tempts procrastination more than almost anything else. Just take the advice of Thomas Couture (who took the advice of his master Antoine Gros, who shared it with Jacques Louis David, who learned it from his predecessors, etc, etc) and use 50% cold pressed linseed oil mixed with 50% turpentine (artist quality not DIY quality) for your under-painting. Then, with each successive layer, reduce the amount of turpentine by 10% and increase the amount of oil accordingly (the 'Fat Over Lean' principle). When you've done so many layers that you've run out of options, you've no choice but to use 100% oil and wait longer between drying times. 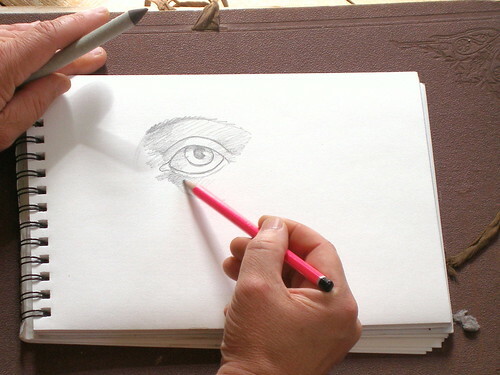 When you have practiced and learned the techniques you MAY want to experiment with the optical effects that other, more complex media may give you (resins, etc) but they WILL NOT improve your drawing or painting ability, so why add this complication? Allergic to turpentine? Many artists use spike lavender oil to thin and mix their paints with and as a glazing medium as an alternative to the noxious turpentine. I have no experience using it but have seen it mentioned in old treatises as a viable alternative, if a little slow drying. I'm also going to skip over the discussion about drawing transfer methods at this point and get straight down to the more interesting bits....... except to say, that I did this one using my trusty piece of home made duplicator paper ( a large piece of paper upon which I covered one side with brown/red pastel) . 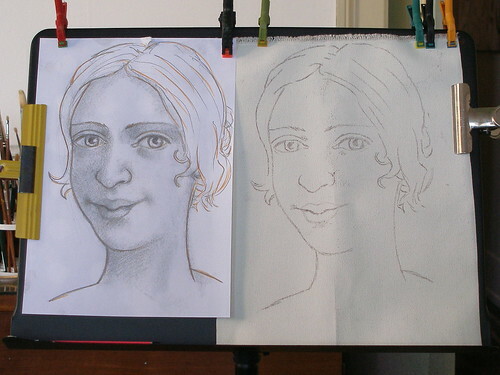 I place the paper over the canvas and the drawing over the paper and simply trace the outlines. I use a coloured pencil to trace the outlines, just so that I know what I've done and what's left to do. I keep the duplicator paper rolled up in a polythene sheet around a strong cardboard tube. Even with frequent use, one of those rectangular sticks of pastel spread across the (1m or 3 feet squared) sheet of paper should serve you well for at least one or two years . Why? Because you're going to be rubbing your brush back and forward across your (usually powdery and fugitive) outlines over and over and you don't want to lose them. Because the paint is going to be transparent, you should always be able to 'pick up' your outlines again if necessary. The earliest form of fixing outlines used ink. Use a narrow Brush and fluid, flowing paint. NOTE that I haven’t outlined the outer edge of the lips, only the centre line. ALSO, I have lined the lower edge of the eyeballs for demonstration purposes but this usually isn’t a good idea either. a. Take two brushes, one smaller than the other, with the small brush mix English red with Black to form a colour called 'Bistre' (originally made from the oak and hornbeam soot of Paris chimneys). Mix with your medium to a fairly thin consistency and start to place it in the shadow areas with your small brush, using your drawing as a guide. b. 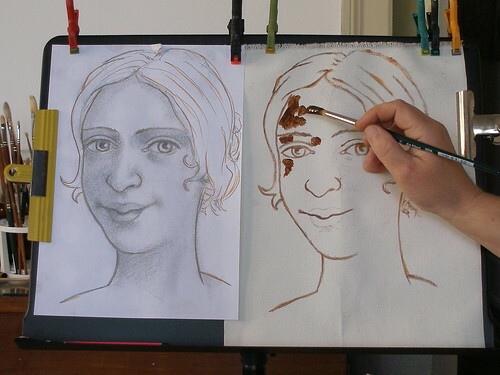 Take your larger, dry brush and spread it out by gently rubbing (to rub = frotter; hence the 'frottis' technique) the surface of the canvas. NOTE that normally, I'd spread the paint a lot more with the loaded brush and keep the big, dry brush simply for erasing brush strokes and smoother blending but I didn't think this would come across well in a photo - so I just daubed it on with one brush and rubbed it around with the other. If you're going to copy this approach, make sure you have a large stack of big, dry brushes handy! As you can see, I've already made a mess of it ( the large shadow underneath the eye on the right). That's what you get for running back and forward fiddling with camera's instead of concentrating on the job! Never mind, it's a good opportunity to demonstrate how a painting might be rescued. I think I can correct the size of the shadow in the final stage because it's in an area of light where I'm going to end up using opaque pink anyway. DO NOT OVERWORK - put the paint on, spread it around and leave it alone. If you ignore this advice, you'll end up with blotches that just won't go away. If you leave it to dry and apply more thin layers, you can usually overcome and correct any mistakes and problems. LEAVE TO DRY (an absolute minimum of a week for oil, a day for acrylics). The Italian masters used to put their paintings out in the hot Italian sun to speed up drying times and to 'bleed' excess oil from their pictures. Many experts believe that there are sound chemical reasons for doing this which explains why their paintings have lasted so well. It is worth pointing out, that linseed (or walnut) oil does not dry by evaporation but by oxidisation. So the heat of the Sun would not have speeded drying per se, just the extremely dry micro-climate that such heat produced near the surface of the painting. Trying to speed drying near a source of artificial heat doesn't work! Putting the painting in a room with less humidity does work. Normally, I would apply a few more 'spot' glazes in areas where the shadows need to be strengthened (shadow side of the nose, eye sockets, under the nose and lips, etc). 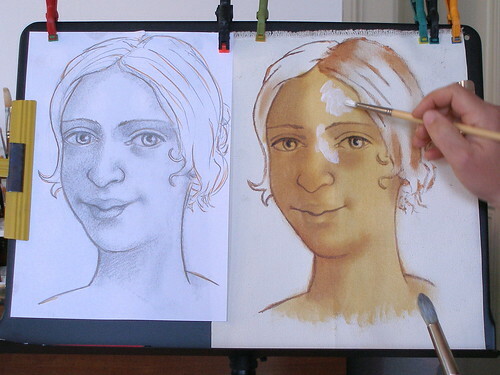 It depends on lighting conditions and how well the appearance of the skin tones fit with the painting as a whole. Now is when I would usually start to introduce areas of 'blue' as well. For the moment though, I'll stick to my plan of doing the minimum amount of work possible. For this stage, you'll need a soft brush which you can load with quite a lot of (very fluid) paint and a dry, soft brush just to erase the brush strokes and ugly streaks. The ‘loaded’ brush for glazing is usually of the flat type, with rounded bristles. Softer, finer bristles hold more paint and spread it more evenly but again, with practice, you can use almost any type of brush. If you’re uncertain, lay your painting flat in order to glaze. When you’ve learned to get the consistency of your paint just right, you won’t need to do this any more. a. 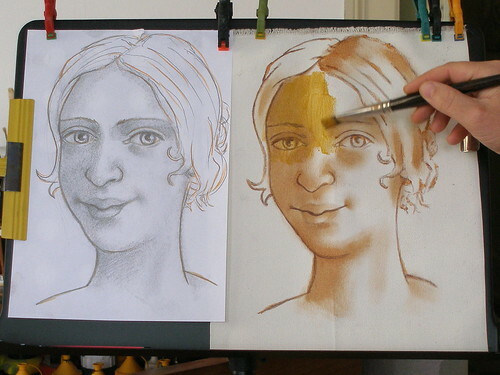 Spread your yellow ochre paint evenly across the whole of the surface of the skin. b. Smooth out ugly streaks or brush strokes with a dry, softer brush. I'm using a pony hair brush but if you keep your brushes clean and fluffy, you can get on just as well with hogs hair if you're using oil paint. I find that I need something softer for acrylic because - even using a retarder / medium - the surface starts to 'skin' very quickly and a rougher brush starts to lift that skin (instead of gliding smoothly over it). IMPROVEMENTS: There's no theoretical limit to the number of glazes you can apply. 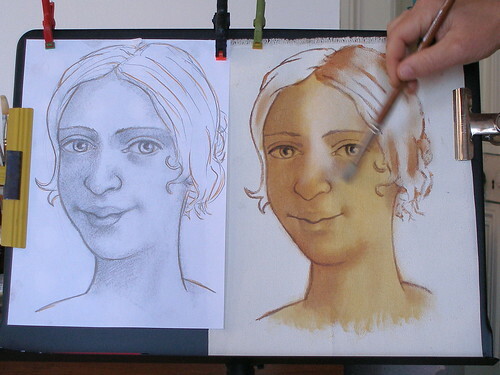 The final colour you are aiming at depends on the lighting conditions of the rest of the painting. 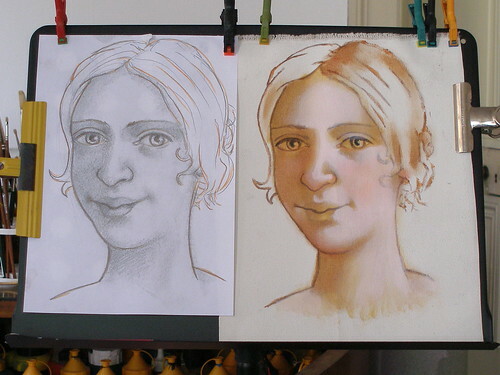 As a general rule for skin tones though, a few more than this will add to the 'diffused' effect and level of refinement. Too many and your skin will lose it's vibrancy and start to look like mud. So it's just a question of practice. I have often read that Titian applied up to 40 glazes. Well he might have done to his shadow areas but if he had done that to his skin tones I don't think we would know his name. 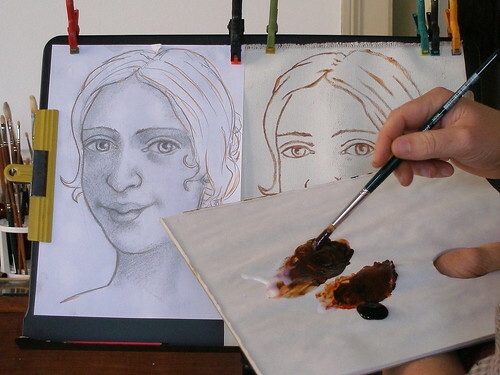 With other objects (fabrics, metals, etc) use your glazes to keep pigments separate and pure, i.e. if you want orange, glaze red over yellow or vice versa (obviously allowing each glaze to dry first). This way, your pigments will maintain their pure brilliance. Having said that, it is good to mix techniques in the same painting for the sake of contrast (some areas transparent, others opaque), otherwise your painting can start to look like a collection of cellophane sweet wrappers! a. Dab on white paint, as you did with the bistre in stage three but this time starting in the highlight areas as opposed to the shadows. b. With your big, dry, fluffy brush spread your white paint across the highlight areas and into the mid-tones with a gentle rubbing action. KEEP THE WHITE AWAY FROM THE SHADOWS. Once you've accidentally scumbled over unintended areas of shadow, only a large amount of re-glazing with bistre, browns, ochres, etc will regain lost depth. That early mistake is still showing through badly but there's still hope! Apply more white paint to the absolute highlights to make them more 'solid'. What you're aiming for is near white in the absolute highs, a 'halo' of pale creamy yellow around those highs falling away into cream for the mid tones and edging toward orange/brown (or orange/ green, orange /blue - depending on lighting conditions) on the edge of the shadow areas. STAGE SIX - Solid painting (and a little more glazing). Glaze over the upper cheeks on the shadow side of the face with vermillion (smooth it out with a soft dry brush). Do the same to the tip of the nose, the chin, the earlobes etc. Mix a very tiny amount of the vermillion with white and paint in your highlight areas with fairly solid (but still thin) paint - blend the edges with a soft brush if necessary. It is this contrast between pinks and creams which gives skin tones their natural colours. If sunlight is weak (early morning or in a 'cool' room), there will be less pink in the highlights and more blue. So the highlights will look a little purple and the shadows a little more green. Hooray, the shadow 'incident' seems to be correcting itself! OK, I know I've rushed this stage a bit but I'm trying to fit this in with paying work, sorry. Anyway, lips in vermillion, whites of eyes in blue/green/greys (leave a little of the ochre showing through if possible), darken eyelashes and eyebrows and that's about it. It has been quite difficult to leave the painting alone and stick to my original plan of using the absolute minimum number of stages and glazes - especially given the number of obvious improvements that could be made. Still, I hope I've done just enough to give you the basic idea? Apart from taking more time to strengthen shadows, etc, one major improvement at this stage is usually to glaze your entire skin area or even your entire painting with burnt umber ( possibly with a tiny touch of cobalt blue mixed in). It tends to have a wonderful 'unifying' effect on all of the tones. If you've been working in oils, you can even add new pinks into this burnt umber glaze while still wet to re-state the highlights (called wet into wet painting). It doesn't work with acrylics though, for reasons I've already mentioned. Try not to think of varnishing as an optional extra. 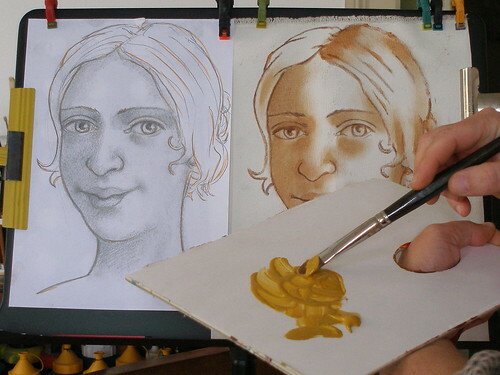 Using these techniques, you will find that the painting won't show it's full potential until varnished. If you're using oils, you'll have to wait a year before the final varnish but in the interim you can use Retouch Varnish as a temporary protection. The varnish deepens the shadows, diffuses the light and adds another layer to the levels of 'deception'. Try it, you'll see what I mean! I've had enough for now and I'm sure you have too. In the next post, I'll talk about alternatives, more improvements, shortcuts and try to answer any questions you might throw up. ..... And here's the same thing in oil, with (most of) the 'improvements' I mentioned in the above demonstration. It's worth noting that some artists use a cool green as part of the initial underpainting process, applying it at places where the bone nears the skin surface and contrasting with the pink tones in the more fleshy areas. My photo's don't show up all of the nuances with such pale colours very well but if you under paint with bistre, glaze yellow ochre over the top and then scumble white toward the shadows, an optical illusion occurs in the intermediate zones where they appear pale blue green. There are many ways to work, you could, for instance, start by glazing the whole canvas with yellow ochre mixed with black (verdigris), then do the light and shade with an earthy red like English red. If you then scumble white over the top, you get an even stronger optical illusion of blue /purple in intermediate zones - you don't actually have to paint the blue on. If you finish with a glaze of umber, it turns this blue effect into pale green. If you glaze yellow ochre over the top of the above before the white scumble, the intermediates then look 'cool green' as well. Another option used in the renaissance was to underpaint the shadow half of a limb in red and the half in the light with blue. When you then add your yellow ochre glazes, scumbles and pinks you get skin colours similar to the ones used by Michelangelo.